The World’s largest cruise ship has been named during a ceremony held at the new Royal Caribbean cruise terminal in Miami, Florida. For the first time in the industry, a cruise ship has been named by a godfamily! 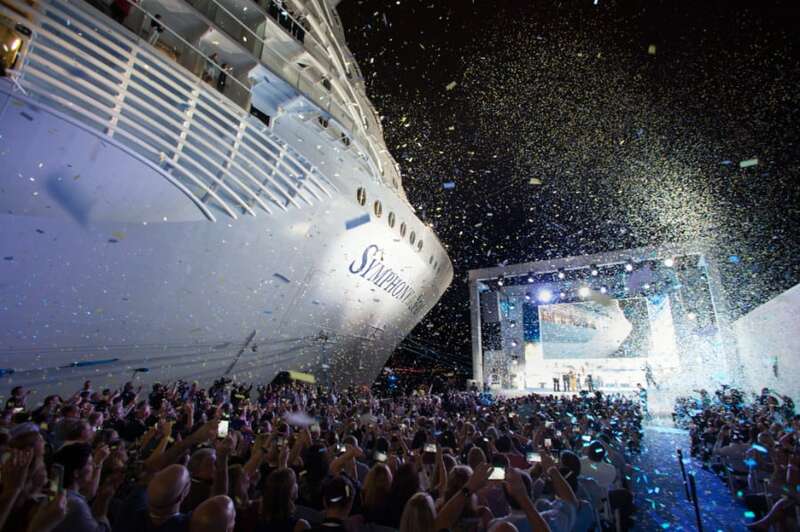 Almost 1,000 people attended the historic naming ceremony of Royal Caribbean’s newest and largest ever cruise ship Symphony of the Seas. The naming ceremony took place at the new Royal Caribbean Terminal A at PortMiami and at the center of all the attention was the PenaVega of Alexa, Carlos and son Ocean. During the christening event, there was an electronic violinist throughout, Florida International University’s Marching Band, students from Miami Southridge Senior High put on drumline performance. To finish of the special occasion was the christening of Symphony of the Seas with the traditional champagne bottle smashing on the ships hull. Now that the Royal Caribbean Oasis-class cruise ship has completed her inaugural season in Europe the ship will begin Caribbean cruises from PortMiami. Symphony of the Seas will offer 7-night Eastern and Western Caribbean itineraries including calls to the cruise line’s private island “Ther Perfect Day in Cococay” in the Bahamas. Symphony of the Seas made her Miami debut on November 9 and the day before that made her U.S. debut by arriving at Port Canaveral, Florida. The new vessel will begin her regular service on November 17. She’s a huge 228,081 with a guest capacity of 5,518 at double occupancy.